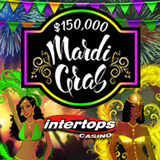 Join the red hot Mardi Gras celebrations at Intertops Casino and dance your way to $30,000 in weekly prizes! During the $150,000 Mardi Gras casino bonus contest, you'll earn points when you play and win prizes based on your points ranking. Every week until March 5th, 300 frequent players with the most points will win bonuses up to $500 each. Many more players will get bonuses in random draws! Compete with other players for weekly bonuses up to $500. - $30,000 in weekly Leaderboard prizes -- 300 winners each week. - $1,000 CASH prize at the promotion's end – no wagering requirement. - Random Draws: 50 players win free bonuses every Thursday. The top 20 on the Scoreboard each week are entered in a final draw for a $1000 cash prize. There are no wagering requirements for this prize. It can be withdrawn any time. This year Mardis Gras is February 13th. Chinese New Year is a few days later -- February 16th is the first day of the Year of the Dog. To celebrate the Lunar New Year, Intertops Casino is introducing several new Chinese-themed games. Bursting with luck and happiness, the new Fu Chi slot unveiled last week has a Lucky Dog wild symbol that doubles wins. Fantasy Mission Force, which was unveiled today, takes players right into the middle of the action in this 1980s cult classic inspired by Chinese action movie star, Jackie Chan. Shanghai Lights, expected later in February, celebrates the mystique of the world’s biggest city. Scatters trigger its Super Spin free games feature. Another Jackie Chan themed game, Eagle Shadow Fist, is also in the works at RTG. The new games will be available online for players using desktop or laptop computers and in the mobile casino for those playing on smartphones or tablets. Mardis Gras contest details and current scoreboard rankings are available at http://casinopromotions.intertops.eu/mardigras.